Picture in a Picture from a Weld Camera! 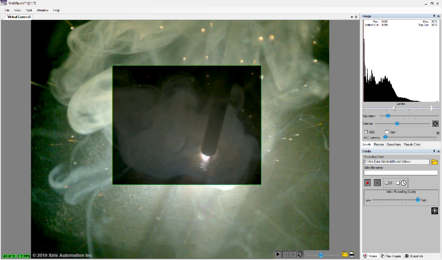 Xiris has recently added a powerful new feature to its WeldStudio™ software utility that controls and displays images from its weld cameras: the Picture in a Picture (“PIP”) feature. The PIP Feature allows for two-tone mapping algorithms to be used on different portions of the screen at the same time, one on the full screen and one on an adjustable inset window. Each tone mapping algorithm will have its own settings to enhance key areas of interest in an associated view. The dual tone mapping is performed right in the camera view by using the camera’s onboard image processing capability and the image is streamed to an external device as one image. The image processing tools inside WeldStudio™ allow the operator to manipulate and measure different features of the weld, to help make meaningful process decisions. The playback mode allows users to view and manage recorded video offline for further analysis, including the ability to slow and freeze frames, view frame by frame, or manage video transfer to an external device. The PIP feature ensures that enhanced images can be created with better, localized contrast that improves the visibility of key regions of brighter or darker brightness in the image. Being able to tone map two regions of interest separately allows the user to see higher contrast image details in a foreground and the background. For example, in welding applications where there is an extreme brightness range between the weld area and its background (such as in electron beam welding or high powered laser welding), a smaller inset foreground window can be placed over the welding arc or spot and be optimized for very bright light localized to that region, while the surrounding darker background can be brightened to see the weld seam, allowing heat affected zones and other darker features to be seen more clearly. By performing the PIP feature inside the camera, fewer external PC processing resources are needed to process the resulting images. In addition, less data needs to be transmitted between the camera and a PC (lowering network traffic that can be beneficial when using multiple cameras), allowing full frame rate to be maintained with the camera at 55 fps. Our users will have full control of the brightness settings, window size and location for the foreground inset window independently of the the settings for the background image. This feature has been implemented to work on both color and monochrome versions of the Xiris weld cameras. Xiris's XVC-1100 kit and XVC-1000e HDR weld cameras are transforming the way aspiring weld operators are taught. 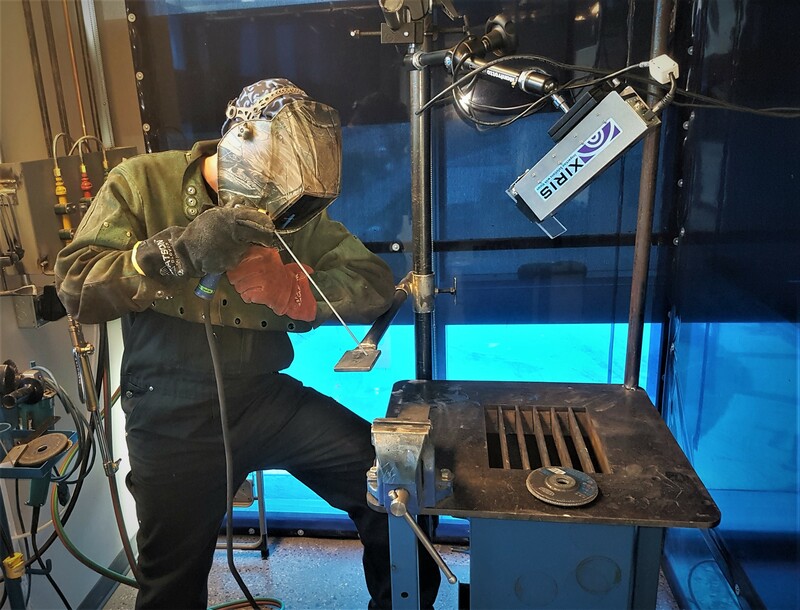 The XVC-1100 weld camera kit, which is being used at the Southern Alberta Institute of Technology (SAIT), enables students and instructors alike to capture and save videos of their welds. During instruction, the XVC-1100 allows students to see what the instructor is doing on a large, projected screen- rather than having to crowd around the instructor performing the weld. During practical work, students are able to perform a weld and save the recorded video so that they can review their weld and technique after they are finished. The Xiris XVC-1100 camera installation at SAIT Polytechnic enables students to film and review their welds. The XVC-1000e weld camera is being used at Santa Anna College. The camera is mounted directly on a weld robot, similar to how welding occurs in many manufacturing environments today-thereby providing students with correct training in the welding techniques they'll use in the workplace once they graduate. The XVC-1100 and XVC-1000e cameras both feature adjustable optics. With a tightly focused view, students can see the interaction taking place between the wire fed metal and the parent material as well as a clear view of the weld arc and the resulting melt pool. When the camera is configured with a larger view of the welding process and its coupon, the student can see all the motion during the weld process so they can learn the hand and torch positioning techniques from the instructor. Both types of cameras allow welding instructors to demonstrate to their students good and bad welds- and what determines the difference between a good and bad weld. As weld cameras increasingly become a standard tool in welding processes of all types, their use in welding education is becoming an important step in the training of the next generation of welders. Not only do the cameras help students learn the basics of welding, bringing cameras into the classroom provides another way for students to learn welding adopt new technologies in their future professions. This is why the use of the Xiris Weld Cameras in instructional settings will continue to grow. Our XVC Evaluation Kit for educators includes everything instructors need to record and playback their welding processes, including cables, an assortment of lenses, and more. If you are interested in learning more about our company and products or using our weld cameras, please contact us here.